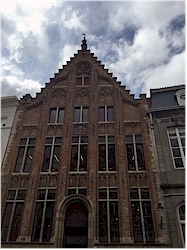 Just like in most of the medieval towns, guilds were also active in Bruges. Guild houses were commissioned by the various guilds. They were the administrative seat of the organisation and the place where they held their meetings. 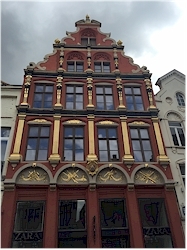 These houses were generally copiously decorated and surviving examples can stilll be counted among the most impressive civil structures in the historic center. The houses they had built were an expression of the wealth and power; the more impressive the house was, the richer the guild was. Guilds decided who was and was not suitable for membership and could consequently refuse certain (groups of) people. They could also have the exclusivity to perform a craft in a city, leading to monopolies. Big guilds had extensive financial abilities but they also had political influence. You could say that in that way they were lobbies avant la lettre. It goes without saying that some guilds were very wealthy and displayed this in their houses.